Heat oven to 425°F. Spray 12-inch pizza pan or 13x9-inch pan with nonstick cooking spray. Unroll dough; place in sprayed pan. Starting at center, press out dough to edge of pan. Bake at 425°F. for 7 to 10 minutes or until light golden brown. Meanwhile, cook ground beef in large skillet over medium-high heat until thoroughly cooked, stirring frequently. Drain. Add barbecue sauce, chili powder, salt, cumin and apple pie spice; mix well. Cook 1 minute, stirring constantly. Remove crust from oven. Spread ground beef mixture over partially baked crust. 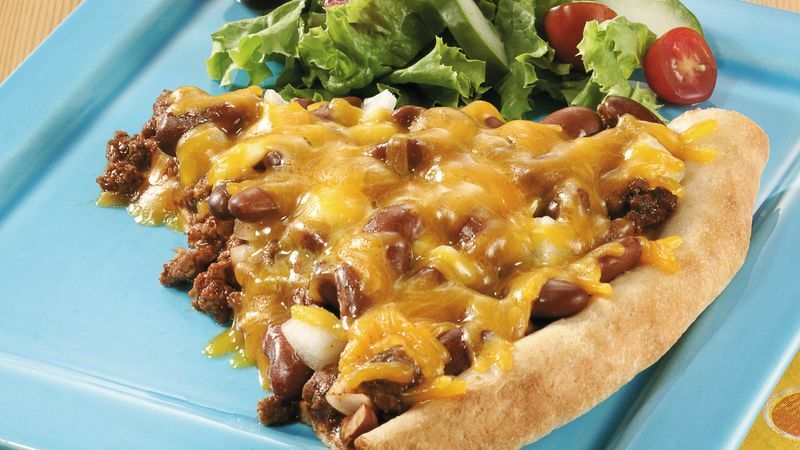 Top with beans, onion and cheese. Return to oven; bake an additional 11 to 14 minutes or until crust is deep golden brown.